According to the Tijuana Health Department, more than one-third of those who rode the caravan from Central America are being treated for an illness. 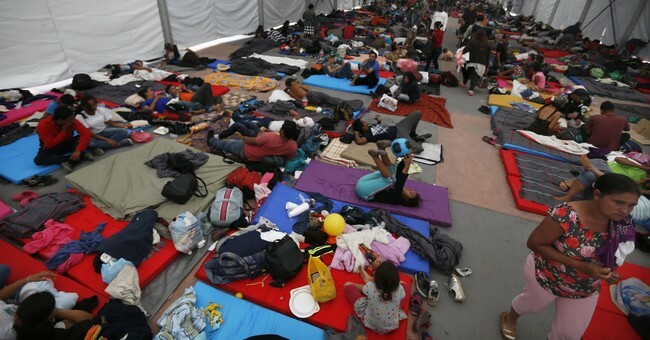 Out of the 6,000 illegal aliens who are currently in Tijuana, 2,267 of them are are ill. Diseases include respiratory infections, tuberculosis, chickenpox and other more serious conditions, Fox News reported. • Three confirmed cases of tuberculosis. • Four cases of HIV/AIDS. • Four separate cases of chickenpox. • At least 101 have lice. The department is also warning about a potential Hepatitis outbreak because the caravan riders are living in unsanitary conditions. Part of that is because thousands of the illegal aliens are being housed at the Benito Juarez Sports Complex near the San Ysidro United States-Mexico Port of Entry. The shelter is only designed to hold 1,000 people and has 35 port-a-potties for them. "People aren't able to take showers, they sleep on the floor, nobody is cleaning the bathrooms, so the conditions are there for a major infection,' Carlos Betanzos, a coordinator for Ministerios Nazarenos de Compasión, an Evangelical aid group, told The Daily Mail. "We've had lung disease, flu, diarrhea, hypertension. One guy yesterday had chicken pox - but thankfully just one." Betanzos said their main concern right now is the flu, which is likely to spread amongst the group because colder temperatures and rain are beginning to set in. "The main danger is flu because it's getting colder and it's going to rain. If there is chicken pox it will be impossible to stop, it could infect thousands. f nothing changes it's a case of when, not if, there is a major outbreak of disease," Betanzos explained. "I would love to say there will not be deaths here, but it can happen because there are not enough doctors and medicine. The government was not ready for this many people." The living conditions are unbearable, which is causing some of the caravan riders to self-deport. Around 80 self-deported on Tuesday alone. Mexican officials did deport 98 people who were involved in the border clash with Border Patrol on Sunday. Clara Daniela, 17, and her boyfriend, Jose Hernandez, 25, fled El Salvador when Daniela's cousin was killed for not joining a gang. They brought along their one-year-old Fernando. "We sleep in the open. It's very cold at night. We can't even make a tent as there is nothing to attach it to," Daniela told The Daily Mail. "The smell is so bad. There is no privacy for women when you take a shower." "There are organizations here helping people who have had enough to go home, they take you on a bus and put you on a plane - it's easy," Daniela explained. "We will try to stay for now but it's becoming more and more tempting to go." Tijuana Mayor Juan Manuel Gastelum said the city is spending approximately $30,000 a day on these illegal aliens, something he refuses to do much longer. He said the city will continue to support the caravan riders for a few more days but after that, it must end.